Having your own podcast is indeed exciting and fun. However, it’s not really always a bed of roses scenario as you need to consider a lot of things. You need to have a steady supply of topics to talk about and discuss with people. You also need to ensure that you have prominent guests who you are going to interview and talk various things with. Then there are the equipment and tools that you need to have. One of the things that you need is a really good microphone for your podcasts. If you are in need of one, we highly recommend you to try out the Fifine Plug & Play Mic. The Fifine Plug & Play Mic is one of the highly recommended microphones in the market because of its features and affordable price. It is really very good when it comes to obtaining and recording audio. 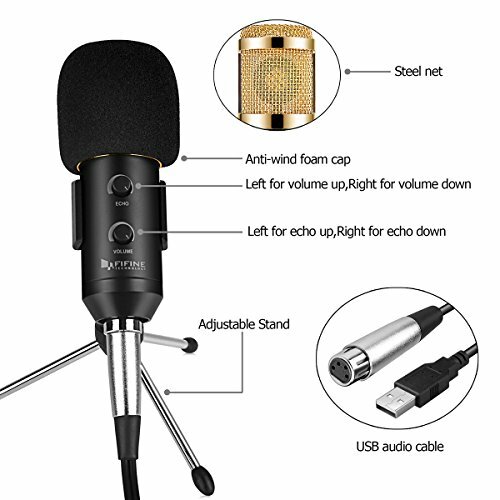 It is the microphone of choice for most podcasters because it produces very clear audio output. If you have a podcast and want to ensure that the uttered words are clearly understood, then you need the Fifine Plug & Play Mic. In order to know whether Fifine Plug & Play Mic is worth the buy, you first need to be aware of the features and benefits of the product. In doing so, you’ll get to see if it is your type or not. The Fifine Plug & Play Mic features USB plug and play connectivity. It is this feature that makes this microphone an easy-to-use product. You don’t need to have a lot of knowledge when it comes to the technical aspects of operating this equipment because using this mic is a piece of cake. You just plug its USB cord into your computer and it automatically becomes ready for use. The best thing about the Fifine Plug & Play Mic is that it has a Cardioid pickup pattern feature. It helps in effectively cancelling out the background noise of the recording session. This ensures that the uttered words of the speaker are heard clearly. This also makes it the go-to choice of podcasters, home studio recorders, and people who are into voiceovers. The Fifine Plug & Play Mic is a very effective and natural mic. This is because getting one does not require you to use or install any kind of extra bloatware that comes in the form of additional software that can cause the slowdown of your PC or laptop. It’s not all about the functionality and audio quality of the Fifine Plug & Play Mic as it is one of the best-looking podcast microphones in the market. A silver white color with its aluminum alloy metal construction surely looks pretty good. It also comes with an adjustable tripod stand and a 75-inch cable. Fifine Microphone is the company behind the Fifine Plug & Play Mic. It has been in the industry of quality and affordable microphones for over six years now. Despite it lacks a couple of essential marketing strategies in the form of advertisements – which is the reason that it is not a well-known microphone product maker – it still managed to survive the years in low profile. This is because all of its sold products are of high quality and can be easily purchased by the average customer because of their affordable prices. The Fifine Plug & Play Mic might turn out to be just fine for you if you give it a try. If you are still skeptical about the durability and quality of the Fifine Plug & Play Mic because of its lack of exposure in the market, you can check out the TONOR 3.5mm, which is its direct competitor in the microphone industry. These two products have a lot of similarities, especially when it comes to features like noise cancellation and high-quality audio output. However, the TONOR 3.5mm has a 12-month warranty and even a 30-day replacement warranty in case there are factory defects or damages. To sum it all up, the Fifine Plug & Play Mic is undoubtedly a reliable microphone that is specifically designed to be used for podcasts and other commentary or announcement activities. It’s a pretty good buy because of high-quality audio output and effectiveness in cancelling out background noise. However, if you are not sure about the unstable and wobbly stand that it comes with, you might want to get another product.